A dear friend dropped in yesterday with her little son. She presented me with one of my favourite flowers - these were part of my wedding bouquet :) Their petal colours range from deep purples to pink to almost white, and I remember picking out the exact pinks I wanted for my bouquet 2 years ago. They now sit prettily in a vase, and I was so inspired by how it made the place look nice that I started to clean up the rest of the house! I have been a real slob these past few weeks and my renewed energy now has resulted in a less messy living space. I think I should talk about other things besides pregnancy, babies, and all issues surrounding these 2 topics. But it seems so hard now! So many decisions-in-the-making are swimming around in my mind! eustomas! flowers i got to know during my wedding prep as well. i love them. thanks for asking me out for lunch today. i had a good time. 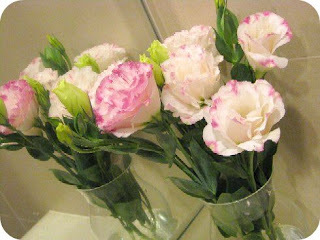 beanbean: Yes I learnt lots of different flower varieties during wedding planning! I had a good time too - next time with Noah!